Celebrating Christ and worshiping together, this Back-To-School Bash is for everyone! Youth and Adults welcome! 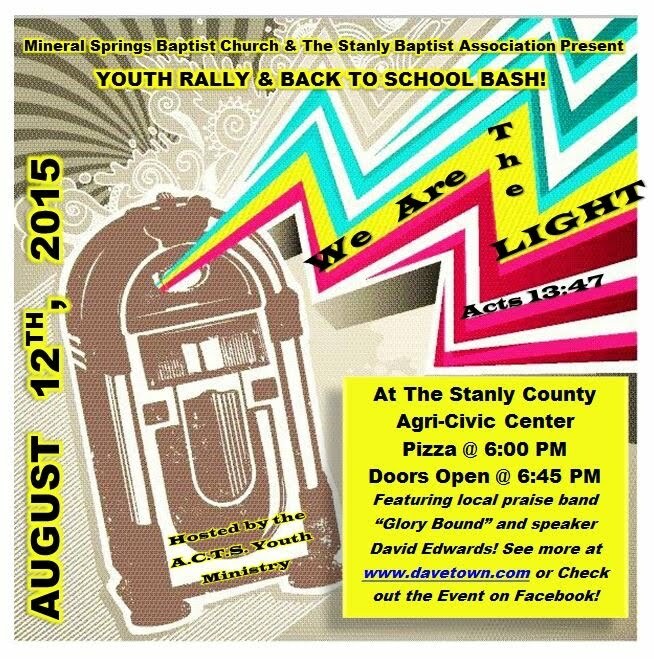 Wednesday night, August 12th, at the Stanly County Agri-Civic Center. Pizza and canned drinks will be served starting at 6:00 PM in the lobby, and auditorium doors will open for the event at 6:45. The service will begin at 7:00 PM with Glory Bound, and a mix of contemporary worship with creative movement. Our speaker for the evening is David Edwards. Please visit www.davetown.com for more information on Pastor Edwards. If you have questions about what it means to be a Christian, what relevance Jesus Christ has in our lives today, or if you simply love to worship and fellowship with other Christians, then this event is for you! Don't miss it! Please invite and share this event! We have 1,050 seats to fill and we don't want a single one empty!